Day 6 at the Cheyenne Botanic. We ran out of allotted time this week to build the garden, so I'll be back in October to finishing up rock-work. I've resisted my usual strategies to "finish a job on time" as I often do in landscaping, as this is different- and I'm not willing to compromise the flow of this particular installation. I think all we really need is a day, which we don't have- and that's fine- an excuse for another trip to beautiful Cheyenne! Speaking of Wyoming: in several places in the garden, we gaps here and there between large stones, especially those that provide a silhouette, trying to make the mound look more broken up in an irresistible reference to Split Rock, Wyoming. There are specks of Pyrite here and there in the big stones, but today we found a great fat chunk of fool's gold. A friend, Sara, drove all the way up from Loveland two days to help out. We began to top-dress in gravel and chips. The whole things gets a blanket of 1/2"gravel, and flecked into it here and there we will use 3/4 and 1" screened gravels to truly make it look natural. 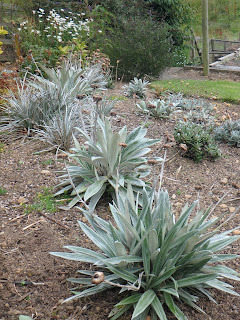 This garden is meant to push and pull against the open soil of the bed it's in- so there are open areas. valley-like and prairie-like interactions between purely tight stone and open, plantable soil. Also, so the whole thing does not reveal itself to the viewer at first glance. The largest incorporated open bed is visible on the lower left, where we've staged the fine gravel for now. Softball-sized chunks around that open gravel bed, will, again, make it look more natural and less like a very poorly placed tiny parking lot. Day 5 building a crevice garden at the Cheyenne Botanic. At the beginning of the day, it wasn't much to see from the second-floor catwalks/skyway between the new and old greenhouses. At the end of the day, it was slightly better than not much to see. Me mastered the key to naturalistic rock work: shards, chips, fines, and token desert trash. Here, Jacob is watering in the sandy fancy-mix. This is to settle it and eliminate air pockets. And to clean the faces off so we have the satisfaction of seeing how it looks before we go home after the day's work. It's more visible from inside the conservatory than I expected- and it's through the dryland section. There was no accident that Shane used gneiss to edge the cactus zone. And I'll be tempted, in turn, to use cacti and agave immediately outside those windows. During the day, while I ripped out and re-oriented rocks we has spent much time setting, it was clear that indeed, like making an art piece, setting stones is a dance and balance between harmony and variety. Unity and disparity. Sameness and difference. A dance. Gosh my legs are sore. Using a Sky Track Telescoping forklift (AKA dinosaur machine scorpion) with outriggers to deliver mixture far into the crevice bed. my skill at estimating yardage and tonnage gets worse. Using a compass to orient the vertical crevices. ZZ opines that linear stratification is only for sedimentary stone; but this volcanic stone naturally breaks off with a cleavage which is not technically strata, but still linear. I made intentional disparities with some big rocks to resolve with small rocks. Trying something new. I tell ya, you really don't need sedimentary/metamorphic-layered stones like sandstone, slate, or limestone, to make crevice gardens. I'll let you know when all is done, but I seriously think this, to work with, might be my new favorite stone of all time. It has pink inclusions in the purple-blue, and we've been finding fun dendrites and glistening iron pyrite (fool's gold!) on some of the big rocks. A mix of sizes is critical. Medium to Large here. Toss in a little (and yes, actually just tossing it) small, varied bits immediately, staggeringly, sets it off to looking like a real rock outcrop. Tertiary cleavage was totally accidental: the lines you see running from upper left to lower right. They are an accidental result of having worked on a primary (at approx. 10 degrees NW orientation, pointing toward the viewer) and the secondary, approx. 50 degree angle of steep "cliffs" facing you. Somehow this third angle showed up; perhaps it is born of the stone's internal (crystalline?) structure? Primary/compass orientation is easy to see from above. But we spent most of the day nearly finishing the satellite patch of crevice on the other side of the entry- to the right of the front doors and visible from the inside of the Orangerie; a dazzlingly-lit beautiful, rentable new space at Cheyenne Botanic. The beautiful old production greenhouse, under current renovation, seen in the left background. There's been another thing I'm doing differently. It's practical: In order to get the right sizes of rock delivered to everywhere on the rockery, we've simply been dumping mixed-sized loads of rock on the very top of the half-made crevice garden. This way, I have a pile on top from which to distribute: to bar. drag, and heave wherever I need it, which is always downhill! But perhaps more importantly, aesthetically, I've been channelling Susan-in-the-Pink-Hat's observation that there is much to be learned about a stone by the way it lands when it is piled or dumped. Certain natural angles of repose, like mineral tarot cards, reveal hidden secrets. Many times, a stone has just landed in a fantastic way that I would not have though to place it. So I work with that. Charlotte was on front desk duty today. How does one place stones in a crevice garden? Here's a serious, if dry, expose of my method, at least. I don't have a strict design, or even a vision for placing rocks. I have a set of limitations and aims. There are practical and aesthetic ones. Private Crevice garden in the Anthem Development, Broomfield. So what am I thinking about while rocks are set? Do you really want to know? Ok.
-stability of present and future rocks/soil from gravity/frost/gardener traffic. -don't bury irrigation under anything that the average person can't easily lift in the event of repair. -leave open soil pockets for big woodies. -Just enough easy, hidden, places to step for maintenance but few enough not to encourage the inevitable mountian-climbing kids off their leashes. -a domestic/designed inspiration: Ota Vlasák. -a natural mountain range as inspiration, The Snowies nearby. -decent rock faces shown, ugly ones buried. -unity among stones in pattern, a reflection/fractal of a single stone. 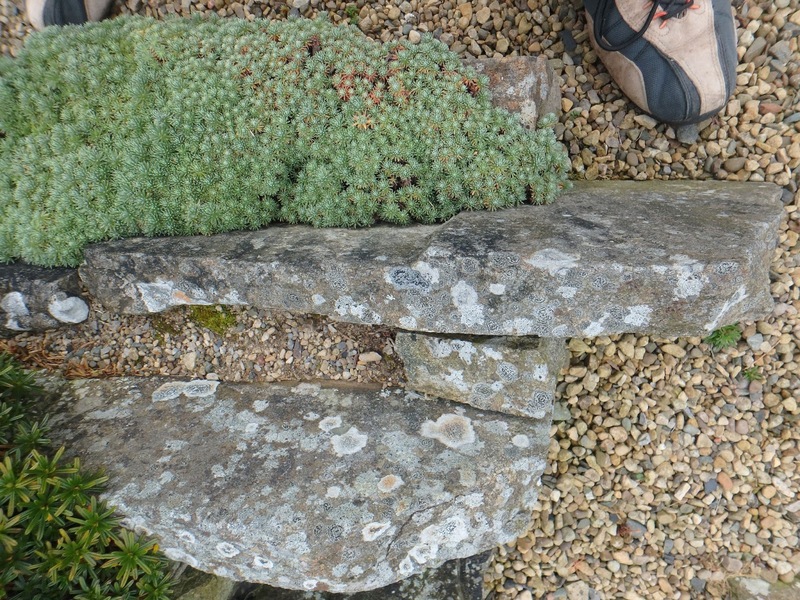 -negative space around footprint of entire rockery, interaction with non-crevice beds. -a hierarchy of the impact of the view from different vantages. -the hardest part: maintaining just the right balance of harmony and variety. Jacob Mares, Horticulturist and equip whiz and myself, photo courtesy of Shane Smith, Director. Day two of the Cheyenne Botanic Crevice Garden, folks. It's helpful to play a bit with some rocks to get a feel of how they relate, so I made a maquette one night next to the rock pile. Before rocks comes the base layer and below-grade excavation of soil. Where stones will be set deeper than the original earth, we dug with a mini excavator, and piled that up where the greatest elevation will be. And added more soil. We brought in two small dumptrucks of a word I've grown to loathe. "Topsoil." I hate it because it means just about nothing to anyone. There is a real definition, but folks in the industry call whatever they want to claim is good for growing plants as "topsoil." Whatever. This stuff is a mature, humate-laced soil, made of silty loam, but screened from sod and displaced soil, so it has very fine, incorporated organic material. It pretty well matches what exists on the site, which is just a little compacted. It was recycled by the City of Cheyenne. Later, there will be a 12-8" layer on top of the most recent iteration of artificial soil mixes. The fancy stuff. But here is what is different this time, based on the performance of the crevice gardens at KAFM and APEX: The fancy stuff will not be too deep; a heavier, decent, original soil will be within an easier reach of plants. A "topsoil." In the past, I've had up to a few feet deep (as much as possible!) of a very light, free-draining mix over heavy clay. This time, the light mix is just a bit heavier, with more expanded shale and a small amount of compost, and not as deep, giving newly rooting plants a shorter race to establishment in the heavier soil. And that heavier bottom layer is sandy silt this time- two steps lighter than clay. 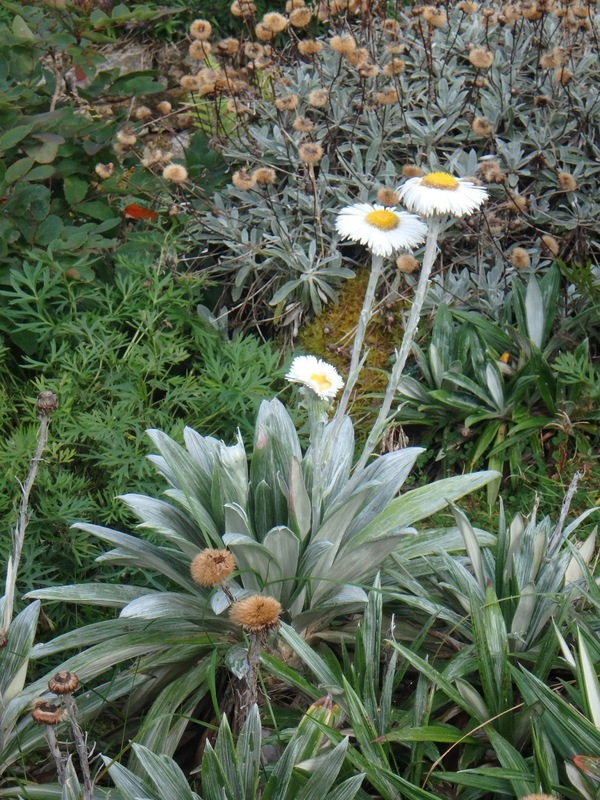 We are not growing just saxatile and mineral-loving alpines or desert plants, which would resent organic material. To sum it up about our this two-layer soil system: Both soils will be a little more similar to one another, and more balanced in proportion, compared to the past. Whew. After working out all that, and visualizing the general shape of the thing, while accumulating the ingredients for the soilmix on the side, it's finally time to set the first stones. Big crevices. Biiig. Let's have shrubs in this crevice garden. Oh? You want the recipe of the new soil mix? Try it at your own risk. Proportions are a good guess. 1 pt SCORIA- (this is screened 1/4" from Paulino's Gardens in North Denver. You could use fine, too. The final mix does not sit there quite like sand; it is more stable. And cakes a little. I hope the plants like our sand cakes. 41 tons of Gneiss from the Granite Canyon Quarry came in two long-bodied End-dump loads. It may have broken the truck's bed gate coming out... This stone is famous for being crushed into gravel, used as ballast for train tracks all around the west. A bit of a challenge using exotic materials. It usually feels like half the work is just mobilizing the material. There is much calling around quarries, truckers, and material dealers. We made plans for weeks, and spent a whole day just delivering stuff on Thursday. Luckily, I am working alongside Jacob Mares, Outdoor Hortculturist at Cheyenne Botanic, who has been creative and capably working ahead of time to get everything "mise en place", as my colleague back home says, before we even break ground. Jacob told me about Rooted in Cheyenne," a city movement which properly plants and establishes trees in Cheyenne cheaply and efficiently. I was fascinated to learn that Cheyenne's Urban Forestry Department(click for fun video) uses a cutting-edge tree planting method which echoes some of what is done for rock garden plants. The spring bare-root shipped trees (big sticks in a box) are planted into bays of pea gravel, where they spend the summer and grow out massive root systems. In fall, they are lifted, the pea gravel easily falling away, to be planted bare-root. Those who have been observing the results are stunned, especially by approximately 90% success rates. We ran around Cheyenne bottle-testing sands and "topsoil" to find what we need. Probably one of the easiest and most useful methods of finding out what soil is actually made of. Click the link to arm yourself with a great tool if you don't know about it already. This positively baking hot site will be irrigated to accommodate the greatest range of steppe, alpine, and desert plants. We will use overlapping-path overhead irrigation- in this case "MP Rotators," which operate well with less pressure. The new thing here is that they will all be plumbed in with flexible piping which is only a foot or so deep below the varying, steep grade of the garden, so that in the event of any repairs in the distant future, only small rocks and not giant boulders will need to be moved to access the lines. The other new thing, a challenge, is trying to irrigate it all from the middle without any traditional perimeter heads, allowing us to get dramatic with giant, steep stones right against the path. We are building this garden with the long-term in mind. No matter what, it wont' need as much water as a bluegrass lawn. Otis was on front desk duty. Of the many acres in Cheyenne Botanic Gardens in Wyoming, USA, the Children's Garden is probably the gem. I won't write about it more. Just go there. It is refreshing, after recently visiting Scotland and returning home to our throw-away society, to be in a place where even the unseen backs of buildings, built to last, are lovely. The new building, built to last with hail-proof state-of-the-art glass panels, has one of those fun public pianos out front. 8 of 10 plays on it from passersby is "Heart and Soul". My fingers are crossed for some boogie woogie or Tool to happen sometime while we work on the crevice garden nearby next week. But the new tropical conservatory; three stories, each with a walkable, public area, is stunning. Note the willow-twig elephant sculpture. It's funny- if the vibe reminds me of any conservatory at all, it's that of the Como Park Conservatory in Minneapolis; which is another American town at a Northern latitude where a greenhouse offers sufferers of long winters a great repose from the elements. Cheyenne does not try to replicate the jungle here and play on those expectations- it offers a sort of victorian pleasure-glasshouse nouveau with a little educational twist. I'm impressed for a town of nearly 60 thousand. 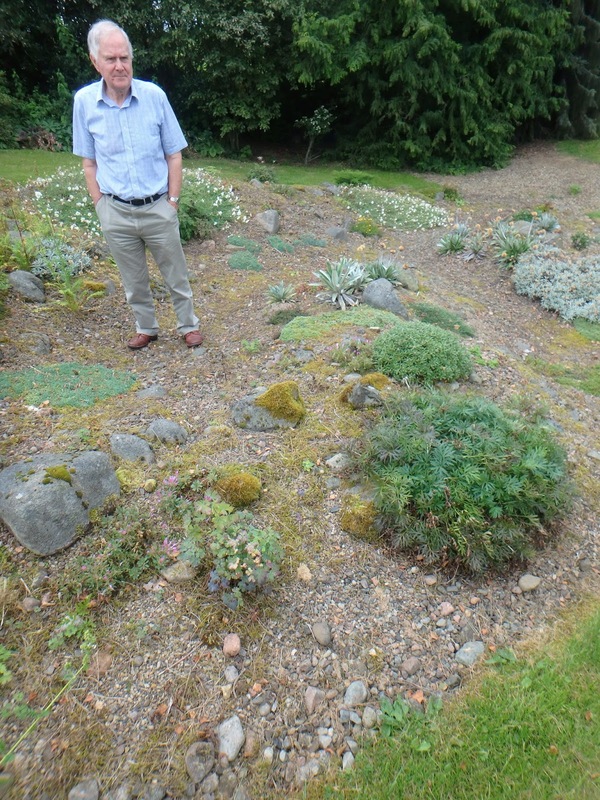 Mr. Alan Furness is a renowned rock gardener in Northumberland, (Northern England, below Scotland) famous for the quality of plants he takes to shows and contests, as well as being an influential promoter of Crevice Gardening. He was a geography teacher before that; and that geological insight shines through his expert crafting of the garden. He observes the rule of tight crevices where it's steep, and open pockets/loose crevices where it's level and more even. He is also a careful observer of keeping strata lines the same width the whole length of their run, which honors the nature of most sedimentary stone. He is using sandstone here. He says the big moment for him which sold him on crevice gardens was seeing one in Northern Ireland, build by ZZ, which had him nearly fooled it was a natural outcrop! He uses sifted soil to fill his crevices, like Josef Halda, the Kingdaddy of crevice garden history. 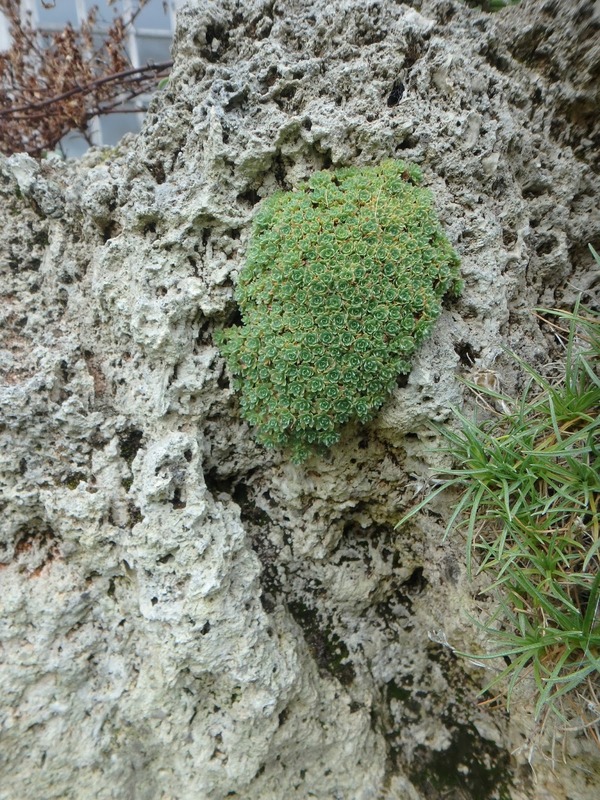 Alan has also been working with tufa, for decades. It's the finest way to grow Saxifrages in the open. And shockingly, the Wyoming heartthrob to all bun-plant fans, Kelseya uniflora. Very impressive. 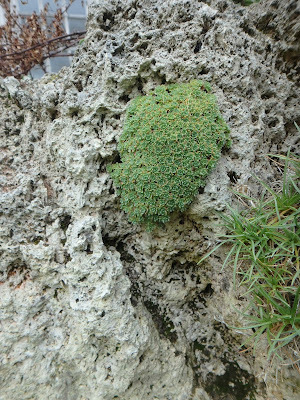 In his climate, he grows is south-facing and on a perfectly vertical tufa face, outdoors. He's also the seat of Celmisia diversity in the UK. Celmisias are a New Zealand daisy-family member with incredible leaves; they are relatively recent in common cultivation; I expect them to explode in popularity one of these days, I've killed one back home. Seeing his lot, I might just try again. He complaints that the pheasants eat the baby plants just set out into the garden! His home was once a chapel for a physician community. Perhaps the part of his garden that spoke to me most directly was his moraine. In his garden, a moraine means the soil and aggregates are arranged such that there is a gradient of gravel and rocks on top to soil deep below, acheived by mixing in several inches of gravel into the soil, topping it with more gravel. Sound familiar? Like our layered-soil crevice gardens. 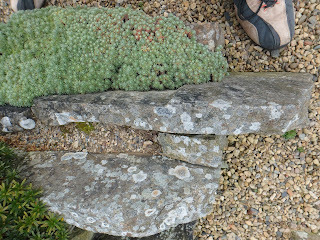 Like the gravel gardens of Beth Chatto and the "Flowering Steppes" in Olivier Filippi's recent book which I ate up like a starving man at four course meal. (I deeply recommend it). I also absolutely love the very natural randomness of the stone. It's artfully arranged, reminding me of Peter Korn's chuck-it-over-your-shoulder and then push-it-in-with-your-boot way of arranging rocks. That kind of design that is so good you don't realize someone did it. The moraine garden is twenty years old, and is the "least weedy part of the garden." How is this so? the gravel is deep enough that there is no soil in between to let seedlings get started. New plants however, are planted and their roots are sent deep into the hole to touch real soil, while most of their necks is in contact with gravel. He says that as the years roll on, a soil is indeed slowly forming in it. It was meant mostly to accommodate Potentilla and Dianthus he said, but Collomia and Silene rock on this summer. I think this is a lesson we could take to the intermountain west, where annual weeds are equally loathed but deep gravel also benefits us by conserving moisture. It's funny, because I had just read about this deep-gravel concept in the Filippi book, only to hear it from the New Zealand plant hunter Steve Newall (who recognized my trying it out at KAFM), and incidentally, Steve is responsible for supplying those Celmisias in Mr. Furness' garden! What a small world of gravel and funny kiwi daisies! What does his other low-maintenence garden look like? See below. What is low-maintenance about it? 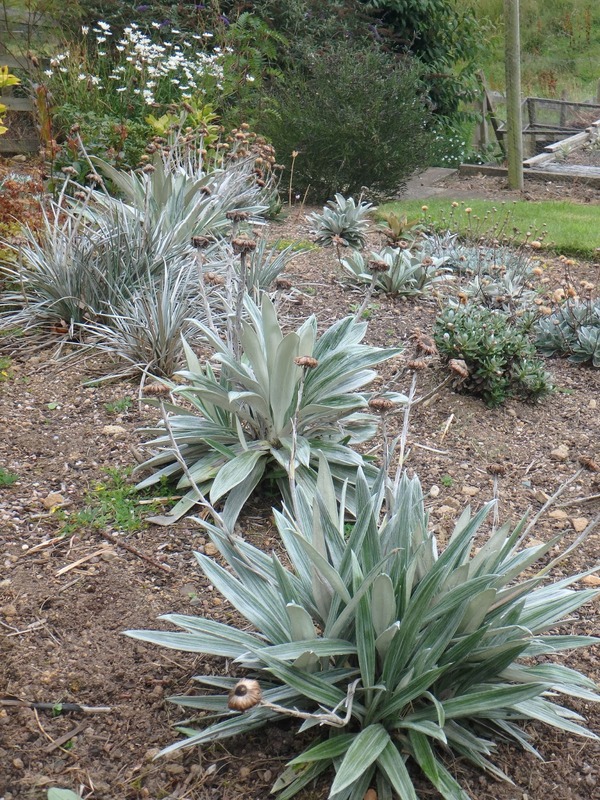 Dense plantings to exclude weeds. Dense and tall enough. Alan opines that Brits, who are surrounded in nature my Heather (Calluna and Erica spp.) tend to have a "snobbery against them," since they are so common, but he says "how else would you have this much color in August?" He continues to say he likes "small, easy shrubs that just swamp the weeds." I think that applies to us back in Colorado, eh? With our own native wee shrubs. He says: "If there is a successful alpine in the UK, it is Heather." A creative cut-in design here allows the gardener and viewers access to ground-level of the middle of the slope. You can get eye-to-eye with a snail here if you want, and the sense of space in the environment attracts you to walk into it, even though it is obviously a dead-end. He built it to create deep, cool shade in the wall to grow Gesneriads. We are inspired by your watchful skill, Mr. Furness.